The Gabby Krause Foundation (also known as Bags of Fun) may have gotten its start in Denver, but it has been taking Kansas City by storm over the last five years. Louisa Weinrich founded the Kansas City chapter at the insistence of her daughter, Melanie, and has been changing lives ever since. Their Mission Statement is simple - to make a difference in the lives of children and their families who are faced with fighting cancer and other long term, life threatening illnesses. I had the opportunity to chat with her about the foundation, what makes it so special, and how Kansas Citians can get involved. Read her answers below! 1. This charity is very personal to you and your family. Who started Bags of Fun and why were they motivated to start it? Bags of Fun (The Gabby Krause Foundation) was started in Denver in 2004 by a good friend of mine named Tammy Krause. The foundation was created to honor the wish of her daughter Gabby, who lost her courageous battle with brain cancer when she was 6. While Gabby was being treated, she was in and out of the hospital a lot and carried a large bag of "fun" with her to keep her busy. The bag was filled with silly things, toys, games, art stuff and more. She ended up giving a lot of her things away to other children she met at the hospital. Before she died she told her mother that she wanted everyone to have a bag of fun like she had...thus the creation of "Bags of Fun". We were big supporters of this foundation as it started, and also had Tammy and her staff mail bags of fun to friends here who were fighting cancer. In 2011, Melanie did her senior project with Tammy in Denver and encouraged me to quit my teaching job and start Bags of Fun here in KC. So we did! We opened our doors in KC in April of 2011 and since then have delivered over 850 bags of fun to children from all over the Midwest. 2. In the years that you have been involved with Bags of Fun in Kansas City, is there a story of particular child (and/or their family) that has stayed with you the most? We have so many children we have delivered to that have touched our hearts. I will always remember our first bag, to a four year old boy fighting leukemia. At the same time his twin brother was in a full body cast for some broken bones sustained in an accident. We delivered two bags, one to each boy and they and their parents were thrilled. I remember seeing the sparkle in their eyes, and joy on their faces. Up until we arrived, their prospects for summer fun were very limited because of their conditions. All of a sudden they had a house full of fun! Another delivery, we delivered to a 19 year old young man who was nearing the end of treatment and his prognosis wasn't good. He hadn't been out of bed in days, but sat in a chair showing his brothers all of his stuff while we were there. Teenagers are hard, they often don't show much emotion, and are often embarrassed about their looks, so we try to respect that. Unfortunately, later that night he passed away. We got a beautiful letter from his parents telling us how much it meant to them that their last memories of him were that of laughter, smiles and he and his brothers playing. Our toys were the last things he touched and now are possessions for his brothers to remember him by. WOW! What a legacy we leave! 3. How can someone can get involved in this cause? We always need volunteers. Everyone wants to stuff and deliver bags for our kiddos, and we have a wait list for that. One way to stuff and deliver quickly is to sponsor a bag of fun. Everyone who sponsors has the chance to stuff and deliver, and all donations are tax deductible. We have about 30 people on our steering committee which helps plan and execute fundraisers throughout the year. Fundraising is backbone of our foundation as we go through around $125,000 each year in toys and electronics. We are always looking for people who want to plan a fundraiser or community event. We have had kids plan lemonade stands, garage sales, walks, and host birthday parties for us! We have had adults host restaurant nights, live music nights, bingo nights, work place fundraisers like jeans days, pancake breakfasts, open houses, workout challenges, and more! We have had schools host fundraisers, loose change drives, contests, and more. Anyone who gets involved loves being a part of what we do! People often ask if they can donate backpacks or toys...we have a national sponsorship with Samsonite and High Sierra so they do our backpacks; and since each bag is picked specifically for each child we don't like to stockpile toys. But we do use Amazon and Target for our electronics so we can always use gift cards for that! 4. How has Kansas City received the foundation? What is the support like here? We have such wonderful support from our KC community! Both Royals Charities and KC Chiefs charities have helped us in the past. Thanks to the generosity of our community we are able to deliver to children from the KC area no matter where they are being treated, and children from all over the Midwest who are being treated at KU, Children's Mercy, and Springfield Mercy Kids. We are hoping to include Storemont Vail in Topeka in 2017. We are trying to partner with other local foundations to expand our pediatric populations at these hospitals...some of the new area we would like to serve include children suffering from life threatening burns, life threatening accidents, and the kids suffering from severe cystic fibrosis. 5. Tell me a little bit about your White Party that's coming up! How many years have you thrown this party and what can guests expect this year? How do you use the money raised from this event to help Bags of Fun? 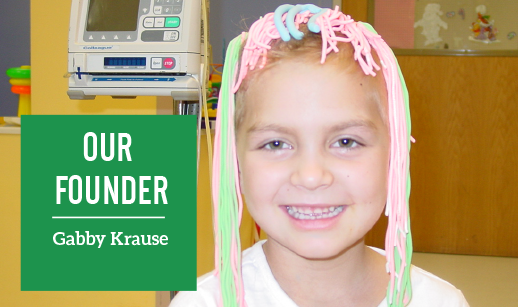 Each year we host our major fundraiser in September because it is National Pediatric Cancer Awareness Month. Even though we deliver to other children as well, children fighting cancer are 70% of our population. Our 6th annual Black and White Party is coming up in September. This year is it September 23rd at Union Station. Each year we have been blessed to have a sell out event with a wonderful crowd! We are hoping this year to double our attendance. Tickets are $125.00 per person, table of 10 for $1250.00. We do not have an auction, it is a very fun night of games, schmoozing, photos, and dancing. "Lost Wax" is performing this year along with a few surprises! Each year we manage to come up with something that make the event unique and a night to be remembered. We are not printing invites this year, so anyone who is interested is encouraged to go to our website and click on the save the date and send us their email or purchase a table. 5. Do you have a need for anything in particular (monetary donations, time, specific items) right now that the community can help you with? I think I answered this already- but MONEY is always our top priority. We operate at an 8% overhead, so you know that 92% of all donations go straight to our program. We do one thing and do it well...delivering bags of fun to kiddos who are fighting for their lives! We know that this brings joy and laughter in a place where these children are often isolated, hurting, and going through things no one should have to go through.